Bouncer presented to Jubilee veterinary centre 2 weeks ago and could hardly stand on his hind legs. He had gone lame on one back leg 4 months before and a strain had been diagnosed. In the following months however both knees had gotten progressively worse to the point that he was struggling to get up and down at all. Bouncer is a big dog weighing 44kgs. On examining him, Gareth Torney found that both of his knees were unstable and that he had a ruptured anterior cruciate ligament in both knees. No wonder he was so sore. Traditionally we have repaired this condition by removing the diseased ligaments and creating new ones using 100lb breaking strain surgical nylon drilled through holes in the tibia and the fabellar bones at the back of the knee. This procedure has served us very well over the years. Recently new procedures have been developed for large active breeds with plenty of energy. They are supposed to return the patient back to better soundness long term. The Modified Maquet Procedure was developed 50 years ago by a Belgian human surgeon to reduce the pain associated with arthritis of the knee. 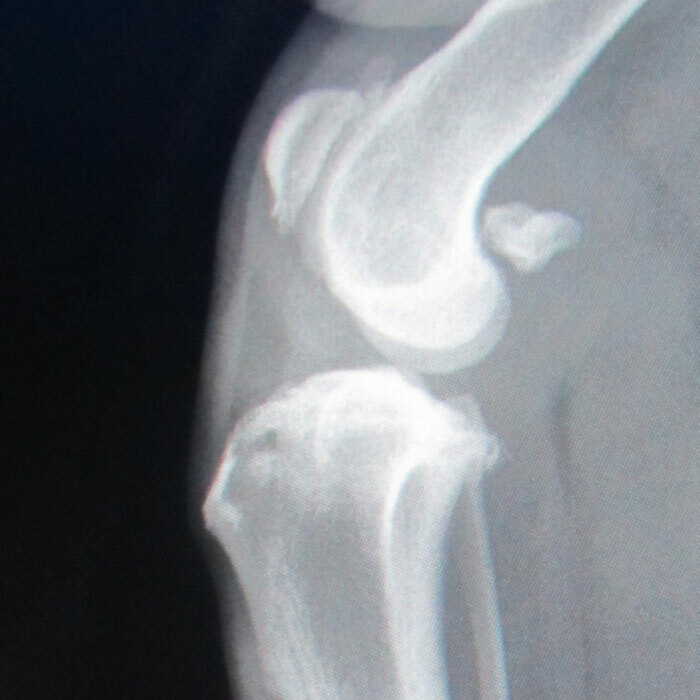 It went out of favour for controlling knee arthritis in people with the introduction of knee replacements. 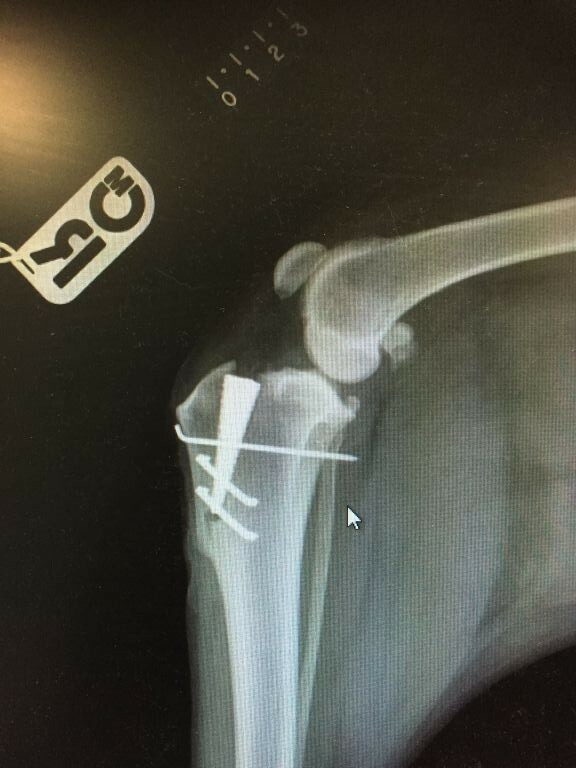 An interesting strength of this procedure was noted that if you advance the attachment of the patellar tendon so that it is perpendicular to the tibial plateau angle of the knee, you no longer need your cruciate ligament. This theory has encouraged its use in our canine patients over the last few years. This is Bouncers right Knee before the surgery. You can see a lot of arthritis around the joint which will cause pain. You can’t see the ruptured ligament because it is soft tissue. 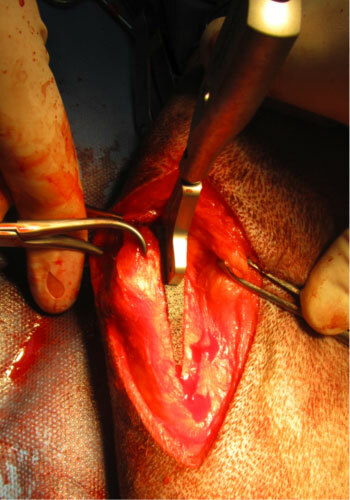 During the operation, an oscillating saw is used to make a cut in the bone of the tibia behind the tendon of the kneecap. This fragment of bone is carefully advanced with pre measured sterile wedges. 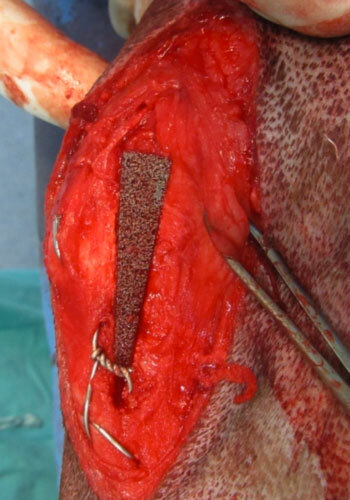 When the advancement is fully made we insert a very advanced sterile titanium wedge called orthofoam into the space and secure it down with a pin and orthopaedic wire. The wedge is specially designed to be very inert and eventually becomes a part of the bone itself. The orthofoam wedge in place secured with a kirschener wire and 2 titanium staples. Hopefully you can see how the implant sits in place and how it pushes the kneecap forward. Bouncer continues to do very well. Dogs having this procedure are xrayed again at 4 weeks and need controlled physiotherapy plans while the bone heals. When the first knee is adequately healed we can then go about fixing the other one. We expect Bouncer to be 100% sound and back to a good level of exercise in this knee by 12 weeks. If you have any questions about cruciate disease in your dog or would like to discuss the M.M.P procedure, please feel free to make an appointment and come and see Gareth Torney at the surgery.